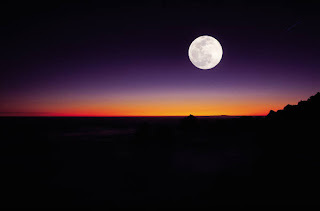 Moon is shown as the beautiful circular light from the Earth. Therefore, in the past time, human realized that the earth is a holy thing. So many people have the great mythology about moon. Some of them call the moon as God, and any other mythology. 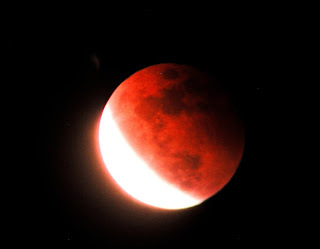 This is happen because the moon just shown as far object that cannot be reached by human in that time. The Moon is Earth's only natural satellite and the fifth largest satellite in the Solar System. It is the largest natural satellite in the Solar System relative to the size of its planet, a quarter the diameter of Earth and 1/81 its mass, and is the second densest satellite after Io. It is in synchronous rotation with Earth, always showing the same face; the near side is marked with dark volcanic Maria among the bright ancient crustal highlands and prominent impact craters. It is the brightest object in the sky after the Sun, although its surface is actually very dark, with a similar reflectance to coal. Its prominence in the sky and its regular cycle of phases has since ancient times made the Moon an important cultural influence on language, the calendar, art and mythology. The Moon's gravitational influence produces the ocean tides and the minute lengthening of the day. The Moon's current orbital distance, about thirty times the diameter of the Earth, causes it to appear almost the same size in the sky as the Sun, allowing it to cover the Sun nearly precisely in total solar eclipses. The Moon is the only celestial body on which humans have landed. While the Soviet Union's Luna program was the first to reach the Moon with unmanned spacecraft in 1959, the United States' NASA Apollo program achieved the only manned missions to date, beginning with the first manned lunar orbiting mission by Apollo 8 in 1968, and six manned lunar landings between 1969 and 1972—the first being Apollo 11 in 1969. These missions returned over 380 kg of lunar rocks, which have been used to develop a detailed geological understanding of the Moon's origins (it is thought to have formed some 4.5 billion years ago in a giant impact event involving Earth), the formation of its internal structure, and its subsequent history. After the Apollo 17 mission in 1972, the Moon has been visited only by unmanned spacecraft, notably by Soviet Lunokhod rovers. Since 2004, Japan, China, India, the United States, and the European Space Agency have each sent lunar orbiters. These spacecraft have contributed to confirming the discovery of lunar water ice in permanently shadowed craters at the poles and bound into the lunar regolith. Future manned missions to the Moon are planned but not yet underway; the Moon remains, under the Outer Space Treaty, free to all nations to explore for peaceful purposes.